We walked onto the UCLA campus for the first time: juntas. My mom’s eyes wander but she stays put, too afraid to explore, so I pull her along. I know what she’s feeling because I feel it too: do I belong here? But I stay quiet and pretend to be overly excited: her anxiety eases. 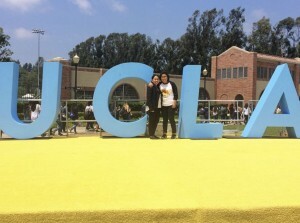 We pose in front of a huge UCLA sign. Esa es mi madre bien sonriente, bien chingona. We then go from workshop to workshop, all in English, as if to remind us that this is not meant for us. Pero estoy acostumbrada, so I quietly translate in my mom’s ears, sometimes too engaged in what is being said that I forget to catch her up to speed. My mom smiles and nods her head as the speaker continues. My heart breaks. Ma, que no sabes que tu inteligencia is not measured by your inability to speak English. Your brain flourishes with knowledge: respeto, amor, sinceridad. Things all these people you call professional lack. Ma que no ves que la educación que tu me diste es la única razón que estoy aquí. Now I am halfway through my first quarter at UCLA and feel the distance growing between us. I do not want it to happen, mi corazón se sostiene pero no es suficiente. I called my mom to ask about what she thinks of me attending UCLA and how it has affected our relationship. She laughs:“Pues ya no me hablas. Eso es lo que más siento, que ya no tienes tiempo. Pero me acostumbro y se que es porque estás estudiando. Son cosas de la vida, los hijos no son para siempre. Pero pues veo que ya estás muy ocupada,” she says sarcastically. I know she is kidding, but she is right. I do not call her enough. It is not that I forget, it’s that most days I am hurting so much due to school that I feel like hearing your voice would only increase my pain. It would make me want to run back home to my safe space: to you. “No como no. Todos los días, pero ya no lloro,” she says as her voice cracks. I miss her. I miss her so much sometimes no se que hacer. Extraño llegar a casa, y ver tu cara después de un dia largo. Abrazarte para recuperar las pilas. I need you most days mom, pero no te puedo decir sin preocuparte mas de lo que ya estas. I have been going through this strange feeling of wanting to go home to my mom forever, but then realizing that I have to keep hustlin’ at this institution for her. Recently at a La Gente meeting I shared with a group of Mujeres that I had been missing my mom and wanted to write a piece about: 1) How higher education affected mother-daughter relationships and 2) How these Mujeres were now navigating UCLA without their madres. I did not expect what was to follow: all the Mujeres collectively sighed and nodded their heads. Soon each of them started sharing a little of how they had been coping with the physical and emotional distance from their mothers. I then asked if they would like to participate in my article: they agreed with full enthusiasm. 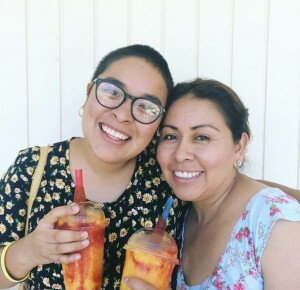 So I begin by opening up a little about my experience and will continue this series by looking at different Mujeres’ stories as they share how they are navigating UCLA sin sus madres.